Viral post...or not? The Dove ad. The digital age, characterized by the ability to transfer information freely and quickly, seems to have resulted in a culture of lazy online journalism where online news sources and blogs vie for attention by creating eye catching (and usually irrelevant) click bate type headings and lobbing the word “viral” around for greater impact. It is often impossible to see everything that comes into one’s news feed, let alone confirm it. Additionally, the truth behind catchy words like “viral” seems to be of little concern. A prime example of this is the recently perceived Dove racist ad campaign. The multimillion rand global soap brand released an advert showing a sequence of three images starting with a black woman who then removes her T-shirt to reveal a white woman and later an Asian woman underneath. News sources around the world have reported on screenshots of the ad – first shared by make-up artist Naomi Leann Blake – going viral. But what does “going viral” actually mean? Urban Dictionary defines something that “goes viral” as an image, hashtag, video, or link that spreads rapidly through a population by being frequently shared with a number of individuals. An example of this would be the 2015 Fees must fall movement where in Mid October, spanning a week– #feesmustfall got over half a million unique engagements within South Africa. Does the ubiquitous Dove ad and its related posts live up to the title of “viral”? At Digital Republic Consulting we are passionate about data and what we can learn from it so with this in mind we attempted to answer this question by looking at the data behind the post. Posts started appearing on South African social media early on 8th October. These first few posts had very few interactions (between 0 and 30 each). It was not until 11:18 when radio personality, Eusebius McKaiser, tweeted about the topic that things started getting heated. He wrote: "Dove: with one quarter moisturising cream... can't clean racism." (image as posted). Local actress Bonnie Mbuli weighed in on the topic an hour later with a tweet about the ad. Over the two day period the most engaged content on Twitter was a Tweet by Minister Nathi Mthethwa which generated 2 574 interactions by 1 278 unique people. The next 8 most engaged posts on social media were all by news media such as eNCA, Times Live, Eyewitness News and SABC. These posts went a long way to promote this topic. It can be argued that without the news media promoting this story it never would have reached the “viral” status is has so far achieved. Now let’s look at the numbers across South Africa…. 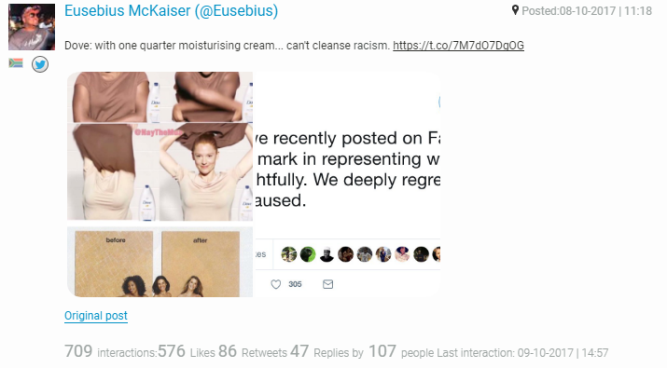 Using our social media listening tool, TRACX, we entered a basic search query to identify mentions, conversations and interactions with the topic around Dove’s racist ad. Looking at the above numbers one could believe that this topic has actually achieved viral status, however, in 2016 the estimated number of Twitter users was 7.7 million and Facebook had 14 million users. When looking at the topic in relation to the usage numbers we can see that about 0.046% of Facebook and Twitter users in South Africa interacted with this topic. It must be mentioned that due to restrictions placed on 3rd party software tools by the social media platforms themselves, the number of users identified does not include users who’s profiles are set to private, it also only looks at data from South Africa. So from the 21.7 million Facebook and Twitter users in South Africa, we were able to identify 9 938 unique people interacting with the topic of Dove’s ‘racist’ ad. To give this even more perspective we looked at the hashtag #dstvdelicious within the exact same setting as the Dove topic. Here we saw that 6 879 unique people interacted with only that specific hashtag over two days (6 & 7 October). Looking at the data again on day three, we can see a drastic drop in the activity around the topic. It peaked on the 9th of October with 9 999 posts and interactions but looking at the same data on 10th October, we see only 936 posts and interactions. Therefore, can we really say that the Dove racist ad topic has gone viral or is it simply a case of journalists being trigger happy on a word that increases excitement and viewership. We’ve all watched movies about interns and hear about our friends & loved ones doing those elaborate “summer internships in Spain”. But what are internships really about? And what purpose do they serve? Either by shadowing an inspiring senior, or doing general ad-hoc duties, the intern will soak up a sea of knowledge during this time because they get to work in a team, under pressure in real world business situations, whichever industry it may be. Learning how different roles in an organisation integrate as a team is something only practical experience can teach you. Real-world perspective & problem solving skills are everything. This is a biggie. As an intern, you could be fresh out of college or an adult considering a career change (remember the intern where Vince Vaughn worked for Google?). Whatever the case may be – you grow or start creating your professional network system that could lead to business opportunities in the future. You could lend a helping hand and vice versa. And if you can, get a mentor as this is crucial to learning about your desired industry whilst having a fantastic reference under your belt. It is one thing to read up on and study a topic but completely another to actually go through a day ‘in the life of…’ Many, many times interns realise a few months into an internship that they do not in fact want to peruse what they initially thought was right for them, but take with them important lessons from the working world, heck even a brand-new skill set from that specific company that they did their internship through. But in most cases, the internship is a solid foundation & preparation where they can apply their knowledge. They have become key in today’s economy because whether the internship is paid or unpaid, they are adding to the workforce in a positive aspect whilst adding value to businesses. Having that experience on their CV allows them a much better chance of landing full-time employment after graduating. Now from a business perspective, bringing in an influx of interns provides an organisation with unique individuals who, if managed correctly, bring in new ideas and a year’s supply of highly motivated pre-professionals to help out where needed – especially with short-term projects so that the senior staff can focus on the serious stuff. This program helps the employer suss out the intern’s working style, how well they add to the organisation, and how quickly they learn. So it’s kind of like a prolonged practical interview, where the potential employee gains experience within the company before being hired properly. This is a great return on investment as research has shown that internshipsincrease employee retention rate. Interns provide employers with so much additional manpower which in turn increases the overall productivity of the organisation because each intern will have specific strengths & skill sets. So as an organisation, creating an effective Student Internship Program provides an excellent element of cost-effective help. These new team members could help grow your business with their immediate assistance. If your organisation has established a well-put SIP guidebook, then you have yourself a fair and consistent process that benefits the community because it helps students pay for their studies as well as contributing intellectual expertise to the educational sector. College campuses are viral societies, so if your organisation does a great job with your first batch of interns, word will quickly catch on and soon you’ll have the most sought after talent asking to be a part of your program. If people are happy working for your organisation your clients will also notice this – and the spiral continues upwards! Internship programs are a way of giving back to the community. We’re not talking about charity cases here in the least. In fact, educating & mentoring the young minds of tomorrow whilst receiving these many forms of assistance is exactly why this is such a fantastic win-win situation as mentioned before. Is it all cookies & cream? Probably not. Whether you’re creating this type of program or joining one takes trial and error (even blood, sweat and tears at times), but a point to remember here is that internship opportunities are not limited to office settings. It doesn’t matter if you are a dog walker at your nearest vet or a note taker for a magazine editor – if you’re a motivated individual or an interested company ready to enter into a mutually beneficial relationship- you’re on the right track. This is how business and networks grow. This Valentines Day, catch your perfect match and keep them. Love is in the air and everyone is eagerly searching for their perfect match, so it's okay for you as a brand to also be looking for your perfect match- someone who will like your posts, someone to chat to all the time and someone to tell the world how much they are in love with your brand. But before venturing out on the quest to finding the one, here are some useful tips to get you started. The perfect match we’re talking about here is the target market and analytical tools such as Tracx can be used to identify the target market and provide insights as to who your type is, where to find them and what appeals to them. As breath-taking as the thought of your perfect match waltzing into your life seems, you need to be proactive and go out and put yourself out there. What better place than where your target markets are likely to be, such as Facebook, Twitter, LinkedIn and Instagram. In social marketing, it is risky not to have a clearly defined target audience, it's not like the motivational speech of "Shoot for the moon if you miss, you'll land among the stars." It just doesn't work like that, because you'll be shooting into the black expanses of space--where no one exists. Targeted posts make sure that your brand posts fall into the right hands, resulting in improved social metrics such as likes, engagement rate, new followers, more efficient campaigns and generate an increase in ROI. The higher your following the better reach you’ll have and a good reach has the potential to generate more leads. After you’ve identified and clarified what you want, it’s time to put the next techniques into play. These techniques include constant communication and feedback as well as getting to know their likes and dislikes. I Remember just how exciting meeting someone new was, I would literally sit with the phone in my hand waiting for his call. Businesses also need to treat their followers on social media the same way, by using a dedicated community management team. This is a team that makes sure that all posts and comments about your brand are attended to as soon as it happens and gets escalated to the right people to better resolve their queries. Think of them as your very own cupid, always there to inspire love and retain customer loyalty. Keep in mind that nothing is as impressive as someone who listens attentively and knows what makes you smile, what drives you crazy and anything else in between. Now you need to aspire to be like that because businesses that use social listening tools are better able to improve or develop their products or services, know their target market's topics of interest, reduce customer’s frustrations and maintain brand reputation. Social listening tools can also be used to stay ahead of everyone else and know what's going on in your industry, what your competitors are doing, what your target market finds impressive about those brands and what their flaws are. Your perfect match obviously ticks all the right boxes not only for your brand but other brands as well. So, it can get a little annoying to see all these brands talking about themselves all the time and your perfect match could simply ignore what you would like to say as a brand and focus more on their friends and family. Don’t have a mini heart attack yet, there’s a way around that. You can use influential people to put in a good word for you, gaining your brand major points. Influencer marketing is not a new concept, maybe you remember it as "Word of Mouth" ring any bells? This type of marketing has the benefit of increasing brand awareness and expanding your reach, another one of your cupids to draw back the bow and let the arrow go straight into your markets heart. We’ve all been on a couple of first dates and this can get a bit tricky as we would like to make a good impression, in our preparation efforts we ask ourselves what to wear? Where to go? What to talk about? Problem is many brands fail dismally here because they do not strategically plan their social media content and gaining a market share is more important to them than maintaining one. The best way to make sure that this is the last first date your target audience has with you and not your competitors is to keep them engaged and in doing so, you need to work out what type of content are you going to post? Which platform will generate the most engagement? When is the best time to post? How often should you post? There is no “one-size-fits-all” answers to these questions, this differs from business to business but this should assist you in answering the above questions and putting together a social media marketing strategy. Same way you would call your significant other every night, your brand needs to also remain consistent and generate posts at least once a day, depending on the type of business you have, the type of social platform and the number of audience you currently have. It can get a little awkward with you and your date just sitting there with nothing else to talk about, which is why you should take initiative and break the ice. But don’t talk about yourself all the time, once in a while share interesting content which has meaning to your target market and they can't wait to share it with everyone else. Your brand can also ask real and thoughtful questions to start a conversation and on the same note, answering any questions your audience has. This is an indicator to your audience that you are paying attention and that you genuinely want to build a solid customer relationship. Once you've got your target market wrapped around your little finger, all you need to do now is to keep the fire burning, keep that spark alive. From there on your business judgement and intuition will take you the rest of the way and your brand and its audience can live happily ever after. National Day of What Now? 13th October is considered No Bra day. Gentlemen, I can almost see those smiles you are all wearing. The craze or trend of social media users picking a date randomly, and linking it to a campaign in an effort to garner some attention towards the subject; is one awesome social innovation. #NoBraDay trended for a good 4 hours on Twitter and brought about a variety of interactions from different individuals - the everyday nudist, rife feminist, creepy and weird airhead; to simple everyday folk. That’s a lot of Big Data to be analysed. This data is crucial to unpack because it reveals new and different perspectives of the same target market the brands have come to know. Understanding this view or different side to them may direct the way brands package their offerings; this to form consumer satisfaction. It is often said that “Knowing is winning half the battle” and “application” is the other half. Fitness fanatics and cancer associated organizations usually gain more engagement (conversation & discussion) on this day than usual because of this initiative. Note: October is Breast Cancer Month – coincidence? I think not. The point here is: there is a huge opportunity to be explored by brands that undertake a particular matter as a point of interest. Insurance companies, apparel brands, lingerie and underwear brands; they too have something to offer in some way or another and in turn perhaps attain sales or further trust from their consumers through this ingenuity. Should a brand such as a publishing/editorial company run their campaigns around such dates and not the conventional or everyday celebratory dates like 23 April, Talk Like Shakespeare Day, no wait, I meant 23 April, National Book Day, then maybe more engagement can be the case. The truth is; what is unusual or different drives engagement. There are 365 days in a year to choose from and each can be altered to suit the brand’s goals, needs and targets. This kind of initiative provides “free” brand awareness. Brands, gear up and gather those sales and marketing brains together. There are a lot of housewives and househusbands needing some pampering and acknowledgement out there. 3rd November marks Housewives Day. The sudden realization of being negligent and unaware of topics, which to a large degree are unpopular but surprisingly important, evokes emotion. It is this emotion that drives the engagement brought about by these special days on social media - this can easily lead to action. By brands incorporating these weird, wacky, sometimes fun and worthy causes into their campaigns they get to be involved in something greater than profit - love for the brand. This brings about loyalty - a valuable entity to any business. Social media is buzzing with excitement. Consumers take to social media platforms to make their small mark on a brand by exclaiming what they like, dislike and would like to see. Brands are provided with valuable customer feedback by simply talking to the right people in the right places. Having a well-constructed social media strategy is just as imperative as performing a thorough social media audit. According to an article in the Harvard Business Review, consumers tend to trust social media messages more than advertising or news articles about the brand, hence, it is the responsibility of the brand to know which messages are having their intended effect. Search engine optimization (SEO) can only be established by knowing what works for you. In order to create useful social media strategies, brands need to know first and foremost how to reach current and potential consumers organically. What is the main objective of a social media audit? Why is it necessary to investigate social media platforms? My company is an SME, is this still relevant to us? What information does Tracx provide? Are you attracting more males or females? How old is the average person engaging with your content? Where are your audience members predominantly based? All these types of questions are answered through a thorough and accurate analysis of your social media channels. Social media audits provide you with the little hidden gems of online data that can help make your business’s future even brighter. Let’s face it; consumers are evolving faster than brands. Much like natural selection there will always be those people who struggle to adapt to the rapid changes, but for the most part, consumers are complaining “better” and the truth of the matter is that consumers have evolved, but brands have remained, generic. Sure, a personal touch takes a bit more effort, but with rife competition in most industries, brands should start to evolve their customer service and not just their service and product offerings. Does it often feel as though brands are fighting this fight by launching a new website or app or some fancy service that is relevant to a niche? Instead of “improving” they are fighting their battles with “more.” Brands are, inevitably, spreading themselves very thin. It is not simply about customer service and keeping up to date with the latest trends in digital with an ever expanding digital strategy that one cannot manage, but rather about really understanding what works and what does not work. Having multiple platforms also confuses people, especially with varying response rates from each platform. Can you say inconsistent? Digital Republic is conducting social intelligence studies across industries in South Africa to determine the “culture” of customers so that brands can better understand their consumers, their frustrations and with that learning we strive to assist brands in incorporating what really matters into their culture and not only their strategies. Consumers know when they are being lied to and brands do not always realise that staff represent their culture in a very influential way. You do not only want customer loyalty, but you want to be sure that your staff are excited to be part of your brand. With Tracx, any brand can have access to this insightful and robust data. Through Digital Republic you can have access to people with the knowledge and experience to translate the data into actionable next steps.